Thunder and rain had been seen to the north and Burke had few problems finding water and feed. They passed Mootwingee and arrived at Torowoto Swamp after ten days. Here Burke appointed William Wright third-in-command and asked him to return to Menindee and follow Burke up to the Cooper with the remainder of the men, animals and stores. Burke wrote to the Exploration Committee announcing Wrights appointment. 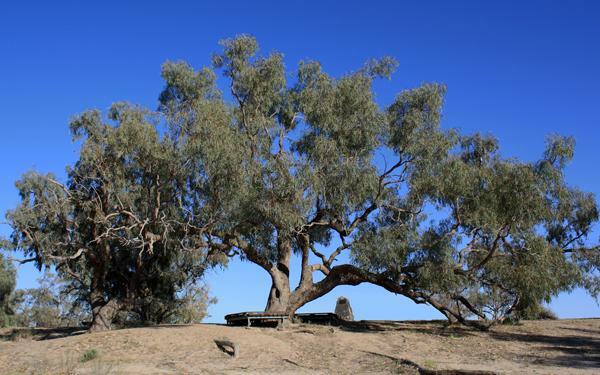 Burke then asked the men if they wished to return to Menindee with Wright, or to continue on to Cooper's Creek with him - they all were willing to continue on into the unknown. Since Landells had resigned, John King, a 21-year-old Irishman, was placed in charge of the camels. King had been in the army in India when Landells had purchased the camels and King had come to Australia on the Chinsurah with him and the camels. He knew little about camels, but could speak the language of the sepoys. The party of eight men headed north into Queensland, camping on the Bulloo River, before crossing the Gray Range to the Wilson River, striking the main channel of the Cooper on Tuesday 20th November 1860, three months after leaving Melbourne. Here, at Camp 63 they formed a Depot and began to explore the country to the north. After two weeks at the Depot, a plague of rats forced the party to move on and they headed downstream to Bulloo Bulloo Waterhole, which is on the present day cattle station of Nappa Merrie, just inside the Queensland border. Here they established a Depot at Camp 65. Burke was expecting Wright up with the rest of the men and supplies at any time and he waited here ten days before deciding to split the party once more and make a dash across to Eyre's Creek and then north to the Gulf of Carpentaria.